Taking minimalism to my closet. Ok, it’s time. I need to talk about something that I really don’t care anything about. It’s not that I hate fashion, or clothing in general. It’s just that, especially dealing with an autoimmune disease, I have only a certain amount of energy for my day, and I want to spend exactly 0.02% of that energy on what I wear. This is why, for the last, oh, since my three-year-old was born, I have basically lived in workout clothes. Like, slightly higher brow than yoga pants. I had about two real outfits from the cheap section of Target that I rotated for church (that looked sad and worn out after the first wash, hence why I hated shopping), and the rest of the time, I looked like I was about to hit the gym. But even since January, when I crashed physically from an flare-up, I’d been wearing the same leggings and oversized Church of the Highlands t-shirt pretty much every day, and I just kind of got to a point where I said, “Enough is enough.” We were on the verge of a move; we were cleaning out and simplifying everything in our house, and in our lives, and I just decided it was time to get my act together and start dressing like an adult. And, to be honest, when you're fighting a disease and lacking in self-care, it can hinder the healing process. That was when I came across an Instagram photo during a night of insomnia of Candace Cameron Bure at a clothing shop in L.A. She was wearing a chambray button-up top and black jeans and talking about a capsule wardrobe she just bought at this cute clothing store. As all good sleep-deprived Instagram rabbit trails start, I checked out their Instagram account and found Instastories of capsule wardrobes consisting of neutral but beautiful clothes that looked like they were made to fit moms who maybe needed their clothes to be as forgiving as Jesus. I perused all the stories of capsule outfit possibilities, and since they were having a sale, I decided to use the money I’d just made from selling my bass amp and older clothes to buy a few starter pieces: a black basic tee, a white tee, a chambray top, black high-waisted jeans (yes, Lord, amen), a black maxi dress, a kimono, and a denim jacket. Man, just from that order, I had about 12-15 possible outfits! And they were all made out of quality fabric, super flattering and forgiving in all the right places, and were age appropriate and modest. Plus, I love that I can support a woman/mom-owned business that produces ethically made clothing. Since then, I have pretty much stocked my closet with CJLA clothing. And I’ll admit, my wardrobe has become a little less “minimalist” than I’d originally planned, but I'm still kind of figuring out what will work for me, and the pieces in it are all so neutral and timeless, they won’t ever go out of style and can be worn a hundred different ways for all possible occasions IN ALL SEASONS. So, no having to buy a whole new wardrobe when the weather gets colder, either. No boxing up winter clothes and shoving them in the corner of the garage or under the bed. I have a feeling I will never have to go shopping in a store, or wonder what I will wear, or worry if something will fit, ever again! That is my kind of fashion. 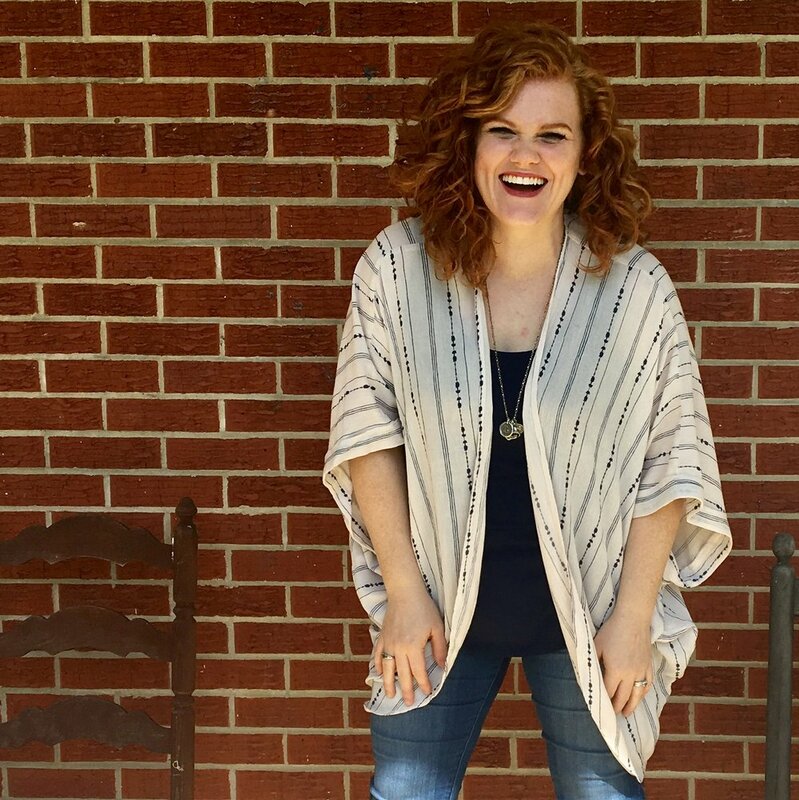 Somewhere along the way, I developed this idea that because I was a stay-at-home mom and not contributing financially to our family's income, I had no business buying myself new clothes. I even felt twinges of guilt as I wrote this because buying for myself seemed so selfish. And what would I need new clothes for anyway? I'm home all day with my kiddos, or I'm playing outside with them somewhere, and regardless, any time I'm with them is basically a workout, so I was fine just wearing workout clothes all the time. And I was determined that I would fit back into my pre-pre-pre-baby clothes one day, so I just kept them boxed up while I basically tried to fit a square peg back into a round hole. None of these things were exactly healthy. 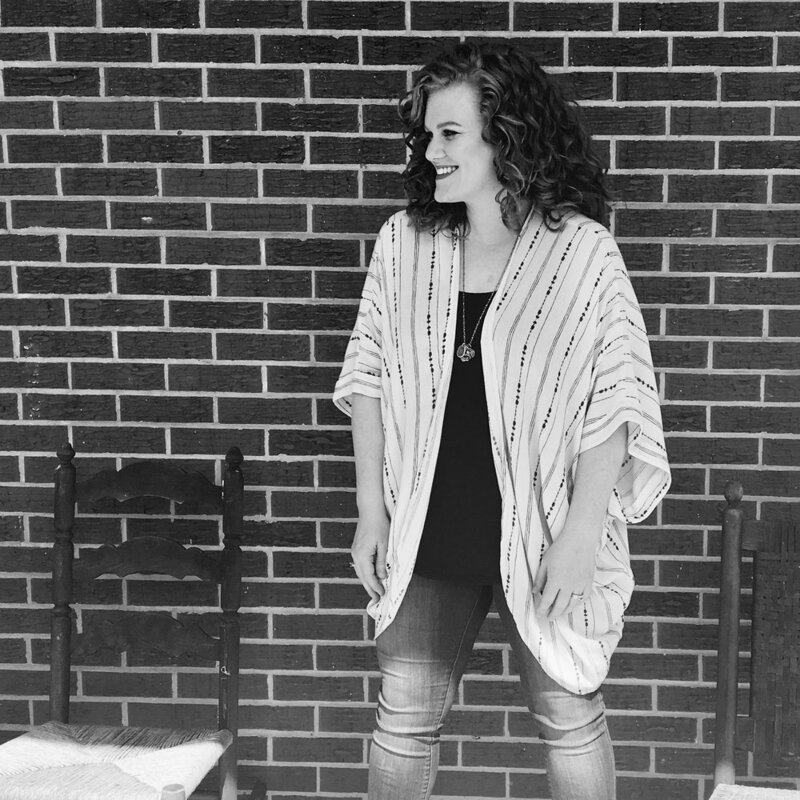 Ladies, it's okay to want to dress ourselves in a way that makes us feel put together. It's okay to remember that you are a woman first and then a mom. (Although I realize not everyone who reads this has children; in any case, it's okay to treat yourself like a person.) It's okay to dress yourself well. And it's really not necessary to have a closet stuffed full of clothes or to break the bank in order to do so. I have about 30 pieces of clothing in my closet, and a ton of room to spare even though my husband and I share closet space. This is plenty, and honestly, I could even pare down some more. But a minimalist wardrobe is not about the numbers; it's about having ONLY pieces that you love, that fit you well, that are well-made and in good shape, and serve multiple purposes. It's about paring down to the bare essentials so that getting dressed isn't stressful or time consuming. And it's a lot about basics. Basics are what make a capsule wardrobe work: neutral pieces that mix and match and can be worn several different ways. My first order from CJLA was pretty much all basics. If you check out my Instagram highlight, I actually show you the basics that are in my closet. Everything in my closet goes together and can be dressed up or down with very little thought because it consists mostly of basics. So, maybe you’re like me and you’re a stay-at-home mom who has a hard time justifying buying clothes for yourself when you spend most of your time at home. Maybe you’re a young professional who feels a little chaotic and you could benefit from simplifying even one aspect of your life. Maybe you can’t afford a lot of new clothes, but with the right pieces and a little direction, you could make a capsule wardrobe go a long way. Maybe you are also dealing with a physical ailment that has left you feeling pretty low, and you could use a little boost in confidence. Whatever your reason, if you want getting dressed to be simple and easy, then maybe a minimalist capsule wardrobe would work for you, too! Real life! My daughter was watching me take photos and snuck a fry when she thought I wasn't looking. Cutest little fry thief I've ever seen. She also loves the avo dip! I posted these baked fries on Instagram and had so many people ask me for this recipe that I just HAD to make them again (darn) to share! Y'ALL: fries are practically my (and my husband's) favorite food (besides pizza, pasta, ice cream...), but of course, since I'm not 14 anymore, running through the drive-thru all the time just isn't doing my body good, so I was happy to figure out a good way to make them at home. They have just the right amount of seasoning, aren't greasy or full of fat, and DELICIOUS with homemade avocado dip (guacamole's quieter cousin). I made these with russet potatoes, but I've also made them with yukon golds, and they're just as good. And ideally, soaking the potatoes and letting them completely dry yields a crispier, lighter flavor, but it's kind of a lengthy process, and sometimes we mamas don't have that kind of time when hungry kiddos are in the equation. I've made them by just washing and patting dry with a paper towel, and they turned out fine, so no worries! Without further delay, here's the recipe. Feel free to pin this, share with your friends, and let me know what you think! 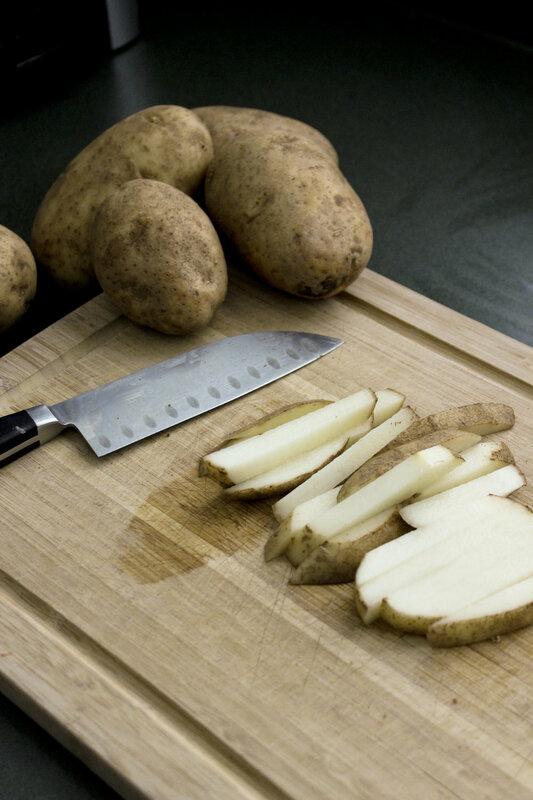 Preheat oven to 425 F. Cut six russet potatoes into 1/4- to 1/2-inch thick strips, trying to make them as consistent as possible. Place in a bowl filled with water and soak for 15 minutes, then drain and set out in a single layer to dry. Meanwhile, mix all seasoning ingredients together and set aside in a small bowl. 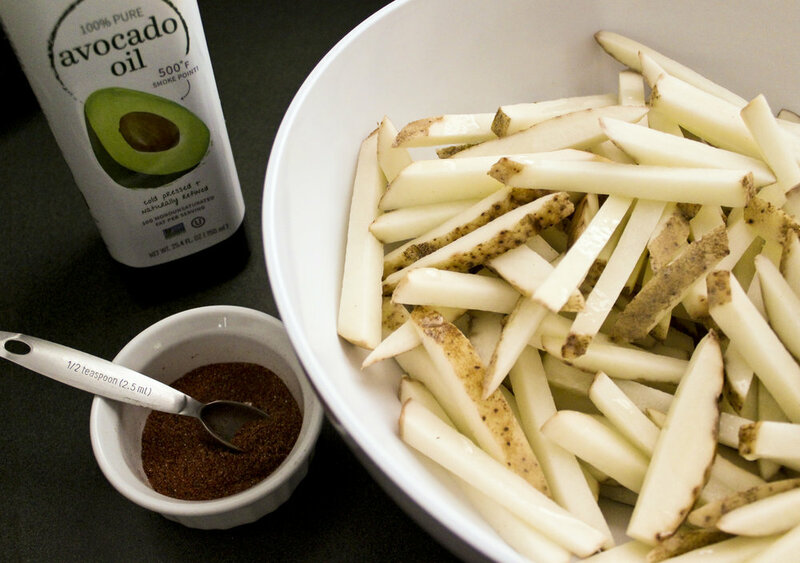 After potatoes have dried, place them in a large bowl and add the avocado oil and seasoning; toss to mix thoroughly. 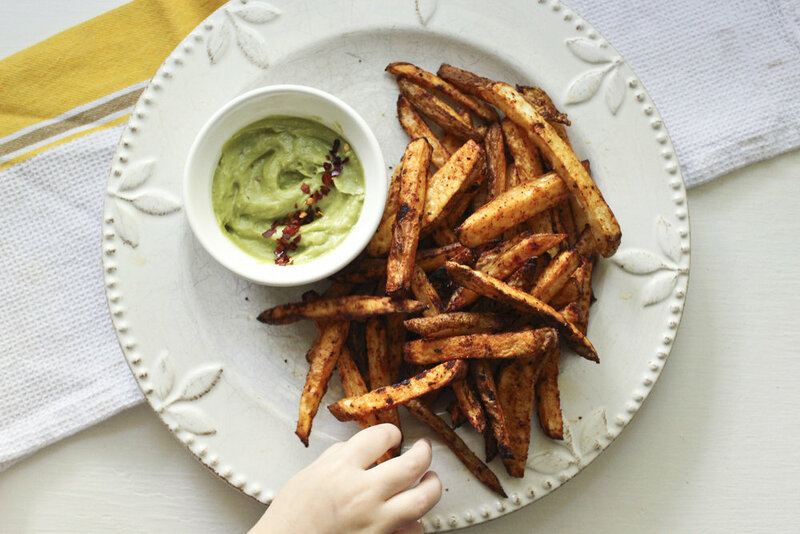 Spread fries in a single layer on two parchment paper-lined baking sheets, and bake in oven for 20 minutes. Remove from oven and turn them over; bake another 20 minutes, or until desired consistency is reached. I like mine a little crispier on the outside, so I actually turn my oven up to 450 F when I place them back in. Immediately sprinkle with salt and serve. Place all ingredients in a food processor and blend until smooth. Let chill in refrigerator at least 30 minutes, and serve with hot fries. Let's start from the beginning. Visit my previous blog page, www.sneakersandspice.blogspot.com to read previous posts. Fill out the form below to subscribe to my blog and stay in touch!